I kid you not I stared at this panel for a good half an hour—even read it backwards—trying to figure out where the dropped 'R' was before I finally turned to my friends at Ink Drop Cafe for help. 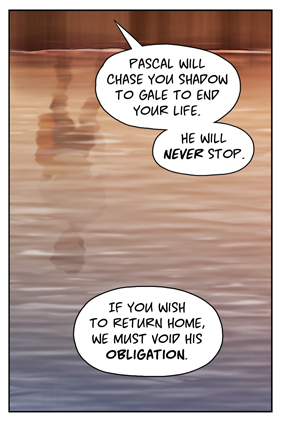 The problem turned out that I'm buried so deep in the lore of Galebound that it didn't occur to me that "chase you Shadow to Gale" might seem like it should have been "chase your shadow to [the] Gale". 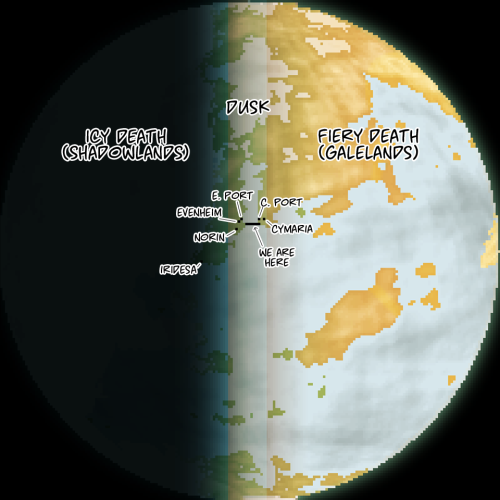 So here's Dusk (which, as discussed in an earlier appendix article, is the name of the planet by way of synecdoche). On the left side (west) is the Shadow and the Shadowlands it encompasses. On the right side (east) is the Gale and the Galelands. In the middle in the Dusk which takes up the world's terminator. "Eight hundred kilometers, give or take, was a figure [Conan] had heard once or read, he didn't remember. That was the width of the Dusk, the band of land and sea that wrapped around the world between the Galelands and the Shadowlands. On one side, the ground froze and any water could only be found as ice. On the other side you had a better chance of your hair catching on fire than getting a seed to sprout. In the middle, in that small band called the Dusk, was life." Because the planet is tidally locked, the Galelands are always facing the sun and the Shadowlands never get much light—less light the deeper you go into the Shadow. By the same token, the temperature gets warmer the farther you go east and colder if you go west. 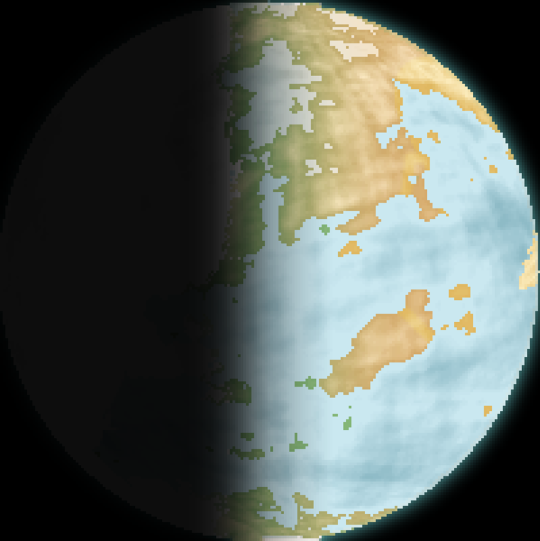 Thermohaline circulation brings some of the warmth of the east to the west (for example, to Iridesa), so the Shadowlands aren't 100% uninhabitable, but outside of the easternmost coasts it's largely an empty wasteland. The Galelands, however, have no such bastions and going too far east is a death sentence. If the heat doesn't kill you (which it will), the hurricane-force winds will. Someday the Galelands and Shadowlands will both be explored further in story canon. For now I hope this clarifies things a little. As a small point of trivia, Conan was born in Evenheim, Pascal in Cymaria, and Din in Iridesa...which might explain Din's icy demeanor somewhat.